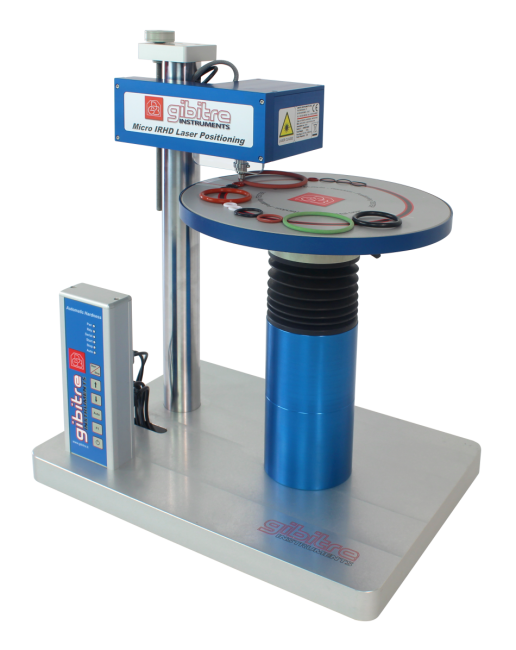 The instruments is supplied with laser centring device and motor-controlled sample holding disk for the displacement of the parts to be measured. The sample holding disk moves each test pieces under the laser centring tool and then places the optimal test point of the part under the micro-irhd testing unit. The positioning and hardness measuring operations are performed automatically for all the parts placed on the sample holding disk across the laser reading line without intervention of the operator. The instrument permits to perform the serial measure of micro-irhd hardness of o-rings and small parts eliminating the human influence in the sample positioning. -	when the complete rotation of the disk has been performed and all the samples have been tested, you can print the test report and save the test results. The sample-holding disk is divided in 4 sectors. According to your needs, you can use all the sectors to test the same product or you can place different kind of pieces in each sector. At the beginning of the test you can enter the identification for the products placed in each sector. In this way each result will be saved or printed with correct identification.